They’re not just physical skills our Little Champions learn. During our classes our students have to be able to listen carefully and follow instructions. They learn to have the confidence to put their hands up and ask if they’re not sure or need extra help. They’re asked for opinions and suggestions (… it takes a brave person to put their hand up in public, most adults are too scared) and participate in class. We have our students volunteer and help demonstrate. They’ll be in charge of exercises… they’ll count our reps and lead by example. All of which are MASSIVE confidence builders and make our classes much more than just punching and kicking. And if our adults find classes good for their confidence then imagine what it can do for your kids! There’s a lot more going on too. Sure children improve their physical skills and learn to help out in class, participate and engage but here’ something else they do. They learn to take responsibility for themselves and the other members of the class. We have partner drills where (… yes) the kids practice techniques on each other. They punch each others gloves and learn to place their kicks and knees on each others bellies. That all takes control and it takes trust from us – the instructors. And guess what? The kids have never let us down because they listen… they respect their instructors and they respect the other children in the class. Their training partners and team mates. 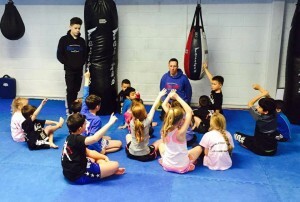 Our Kids Muay Thai classes are great for confidence… they’re great for skill, co-ordination and control and with a little hard work they’ll be where the next Champion Thaiboxer from Crawley starts their journey! Today I spoke to a guy who wanted to get shredded. His words, not mine. And while I know our training gets people shredded (… fighters are some of the leanest and, pound for pound strongest athletes on the planet) it’s a weird word to hear on the phone. A word I associate with the bodybuilding world. But I’m wrong because getting shredded is something we do with all of our fighters and (… if they’re prepared to train right and eat right) something we help many of our members do. The reason our classes are so popular for getting shredded (… remember his words, not mine) is because our training is tough and our training is intense. Punching, kicking, kneeing and elbowing pads with full intensity, speed, power and force is a tough, tough workout. By their very nature our classes make the most of intensity and volume, the two biggest factors associated with burning a lot of calories. You’ll train hard, as physically hard as you can and then there is some downtime in our classes. Where you hold pads for your partner, move around and try to check their guard, their balance and their positioning. It’s an active form of rest. And (… as a gym with active fighters) we incorporate a lot of their training into our regualar classes for folk who want to train recreational too. Tough strengthening exercises and strength endurance circuits designed to increase your cardiovascular conditioning… which create something called EPOC. Which is what people mean when they talk about afterburn and how the body can continue to burn calories for hours even after training. If you’d like to find out more about our fitness classes, if you’re looking for an exercise class with a BIG difference and get the kind of results you’ve always dreamed of then get in touch! You can find out more by entering your name and telephone number into an inquiry box on this page or give us a call on 01293 552 511 and we’ll talk through our training programmes here at our gym in Manor Royal, Crawley. If you’re looking to get in great shape, burn body fat, build lean muscle mass then why not try our boxing classes? They’re physically tough, burn a lot of calories and build a great level of fitness that ticks all the boxes. And if you like the idea but need a little push or are a little daunted, read on because there’s plenty of myths holding people back from starting boxing. So You’ve Never Trained Before?! Neither have most of our members, our classes are suitable for all levels from beginners through to fighters. During each and every class you’ll work on learning new techniques, improving your skills and mastering the fundamentals. From their you’ll either hit pads with a partner or spend time on the punch bags honing your skills. And if you’re worried about sparring, don’t worry! We strongly believe in stepping stones, learn the basics, build your confidence and (if you want) we’ll introduce you to sparring further down the line. One of the biggest mistakes anyone can make is putting off getting started until they are fitter. The harsh reality is most people don’t get fitter and the fitness they build isn’t specific to boxing. Sure running and other cardio will help and build a base but the intensity of hitting pads and working on punch bags is very, very different. Come down, jump in the deep end and work at your own pace. We’ll look after you, help you out and you will get a lot fitter, faster! Most fighters don’t start out thinking they’re going to fight. They start boxing for fun, for fitness or because they got dragged down by a friend. So if you want to train just for the enjoyment that’s fine with us, it’s the reason most of our members got started. But as you get better and realize “Maybe I could fight” and decide to up your training, we have a dedicated team of trainers and fighters who are here to help. Now’s the time to take action. If you’re reading this article, you’re interested already the only think holding you back is the next step. So go on, pick up the phone and give us a call on Crawley 01293 552 511 (or enter your name and telephone number in the box on this page) and get ready to get a sweat on. All you need to get started is a t-shirt, shorts and a drink. Out gym is fully equipped with boxing rings, pads and bags, kettlebells, bulgarians bags, dumbbells, barbells, medicine balls and more. Everything you need to get in the best fighting shape of your life. See you in the gym in Manor Royal, Crawley and open 7 days a week. Because shopping around usually means making decisions based on price which reminds me of the saying “If you think an expert is expensive, then wait until you hire an amateur”. You usually get what you pay for. So what should you be looking for before you pick a personal trainer? Andy Brown of the Huffington Post wrote this article (one of the best I’ve read) where he quite rightly says that if you’re hoping to look like someone from a BodyPower or enter next years strongman competion then you need to pick someone who looks and specialises in that kind of prepartion (and expect a lot of protein, broccoli and chicken consumption)! What you really need is to know what you’re looking for before deciding to pick a personal trainer who’ll happily take your money. So what’s the best way to find out if you’re trainer can help you achieve your goals? Find a trainer who’s already helped others in your situation which brings me onto the next point. Make sure you a) get on with your trainer and b) you meet face to face before parting with cash and committing to their programme. You don’t have to become best buddies (in fact you should be training not chatting during sessions) but you do need to get on and click with each other. If you like to be shouted at, then pick a trainer who likes to shout at their clients. What motivates me won’t necessarily motivate you. Which brings me to the last part. With a background in martial arts, our clients are the kind of people bored with the gym and looking for a more interesting way to get in shape. We have a team of professional fighters who have competed around the world and must be in the best shape of their lives before stepping into the ring. That’ s what we do. We train our Personal Training clients like fighters (minus the getting hit bit) and our clients range from 13 year old children through to 50 year old executives who HATE the gym, want to lose weight, burn fat and get in amazing shape. It’s that time of year when people are setting goals, making (and breaking) New Year’s resolutions and keeping their fingers crossed for a BIGGER better year than they had in 2014. There really is nothing bad about sitting back, reflecting and doing something to make 2015 a better year than lasts BUT you need to do something more than just reflect, think and make a note in your mind. That’s where folk fall down and that is why they fail. Instead of doing, they think. Instead of acting, they talk. Which all leads to 2015 (potentially) being the exact same as 2014. It’s super-simple (like most solutions are) and there is no magic secret or push button solution. All you got to do is Turn Up and start doing something. Forget thinking and making a resolution to lose a stone, two stone or 5 stone in 2015. Instead set yourself a goal to sort your diet out and eat healthy. It all starts with your eating (let’s not call it a diet) and making sure you make long term, permanent and sustainable plans that mean you lose weight and keep it off. Eating that doesn’t just help you look better it makes you perform better too. Eat good, look good and feel good! Instead of thinking about getting to the gym four, five or six days a week just make a small commitment to getting there twice a week. Then turn it into three days and add a little walk here and there. Start with a small, simple change and then scale it. Lastly (but arguably the most important) is social support and accountability which is why personal training is so popular. It’s not just about eating and training… it’s about eating, training, having support and someone to tell (or confess to) when you’ve eaten that bar of Dairy Milk or been a little naughty and eaten an entire pizza for desert. Social support and accountability are perhaps two of the biggest and most neglected factors ‘we’ forget when it comes to losing weight and getting in shape. Losing weight and getting in the best shape of your life is simple. Turn up, do the work and keep it consistent. That means eating right and training right. Keep it realistic, keep it sustainable and keep it consistent. Procrastination is a dream killer which is one of the reasons our fitness classes and personal training sessions are so popular. You book in and you turn up. Then let the pace and energy of the class pull you along and get your body moving! That’s the first step sorted. The next biggie is finding social support and accountability. Finding people (ideally a partner or spouse) who’ll get behind and help you out when times get touch, when you need to be kicked off the sofa or to stop you raiding the fridge when late night boredom sets in and you start to eat for the sake of it. Social support and accountability are big factors. Even if you want to ‘go it alone’ find someone, even if it’s online who’ll help you out and be there for you. Fact. It’ll get you in the fittest and best looking shape of your life and it’s something our team has been doing for close to 20 years now. If you’re looking to keep in shape (or even lose a bit of weight) over the Christmas period it can… be tough. There’s food everywhere, and for the most part it’s they’re not the healthiest options. A super simple tip is to eat well before you go out. Now conventional wisdom says you’ll eat twice as much but with a little care (and a lot of listening to your body) you should end up eating less when you go out. And by well I mean lean protein, low G.I. carbohydrates and lots of vegetables (there should be plenty of Brussels sprouts floating around)! Then you have flexible dieting. Lets keep it simple and practical. Say you eat 2000 calories to maintain your weight. If you’re off out in the evening for a meal and think you’re going to eat 1500 calories — then you make sure you’re breakfast and lunch are only 500 calories. This isn’t an exact science, and it’s not perfect either BUT if you want to eat when you’re out and enjoy the festive season then it’s a perfectly practical option to keep your weight in check. Just make sure to make the most of those 500 calories, full of nutritional dense foods (think vegetables again) and protein. For the simple reason that the evening is highly likely to be higher on the carb side of things. Last tip (you can combine all these options) is learn to make healthier choices when you do eat out. Pick the right balance of proteins, carbohydrates and healthy fats. By that I mean lean protein (think chicken breast, turkey, salmon and lean beef), lower G.I. carbs (think brown not white and starchy carbs instead of sugary ones), and by healthy fats you can have salmon and plain nuts (not salted etc). And lots of vegetables (are you seeing a trend here?) these nutrient rich, low calories foods should become staples of your eating. Away from the eating side of things don’t forget to keep your body moving. The gyms might be shut but that’s no excuse. Make the most of crisp, sunny Winter days and go for a walk, take the stairs and not the escalator when you’re doing your Christmas shopping and squeeze in a few bodyweight exercises (press-ups, chin ups, squats and core work) to keep your body moving. Christmas doesn’t have to be the overindulgent fest many folk think it is. Apply these simple tips, keep moving and enjoy! And if you’re looking for a little help with your eating and exercising come the New Year… get in touch with our team on 01293 552 511. We have over 40 classes per week, offering 1-2-1 personal training and are here to help! Now go and have a great Christmas! Like it or loathe it — weight loss is largely down to creating a negative energy balance. Sure — a calories isn’t just a calories — 300 calories from donuts are very different from 300 calories of vegetables but ultimately if you want to lose weight you have to create a negative energy balance. While most of us attribute that to exercise and diet — move more and eat less — there are two other very simple, very important factors that will make a difference. The first is N.E.A.T or non-exercise related thermogenesis. How to Increase Your N.E.A.T. N.E.A.T. is burning calories that are not from exercise, eating (yes, your burn calories from eating) and sleeping (yep, you burn calories even when you sleep). It might be the fidgeting you do at work, taking the stairs instead of the lift and moving around more. While the amount of calories burned from N.E.A.T. might not sound like a majority factor remember exercise is often as little as 15-30% of your daily calories needs. A small increase in your daily N.E.A.T. can and will have an impact. And often it’s N.E.A.T. that makes naturally skinny people, skinny. T.E.F. is the Thermogenic Effect of Food and can account for 10% of your daily calorie expenditure. In a nutshell the food you eat can and does impact the calories you burn, with protein having the highest T.E.F. So in a nutshell, eat more protein and you’ll burn more calories. One of the biggest problems with Western Diets is that we all eat too many carbohydrates and not enough protein. So most folk don’t eat enough protein (you should try to squeeze in lean protein at every meal, including breakfast) which will a) make you feel fuller b) ensure your protein needs are met and c) help you burn more calories. That’s what you call a win-win-win situation! Do You Want to Start Burning More Calories? Five things our training and nutritional suggestions can and will help you improve. To find out more about our daily fitness classes or personal training for weight loss fill in the enquiry form on this page or call our gym on 01293 552 511. We’re a friendly bunch, here to help and when you get in touch you’ll be making the first and most important step to changing how you look, feel and perform. See you in the gym (hopefully)! The 20% of your efforts that mean 80% of your weight loss…. Back in the 1600s an Italian by the name ‘Pareto’ realised that 80% of the results you get come from 20% of your work and effort. It’s a strange phenomena that seems to crop up all and that includes burning fat and losing weight. I kid you not … you can 80% of the ‘way’ there by just focusing on your diet. You work out two days a week, train hard and burn 600 calories per session (… if you’re lucky, most folk don’t work nearly hard enough to achieve this) leaving you 1200 calories in the red — not bad. Or you could tidy your diet up just 200 calories per day and you’re 1400 calories in the red without stepping any where a gym or working up the slightest of sweat. Now sure both work but the problem with the gym solution is most folk treat it as an excuse to eat some naughty food, have a treat and indulge a little. Just two biscuits with your cup of tea and you’re gone from 1200 calories in the red to 900. And it’s very easy to let it slip further. Proof that tidying up your diet is as (if not more) important than exercise and exercising more. That might sound a little weird coming from a gym who like to see new members but truth be told helping our members eat better AND train harder WITH additional social support really is why we can help our members and personal training clients succeed where other methods have failed. While you can get 80% towards where you want to be with just diet the harsh reality is discipline often gets in the way. Or rather a lack of discipline gets in the way, holds us back. That same lack of discipline coupled with the horrendous food marketing we’re bombarded with daily can — for many of us — make looking how we want to look a near impossibility. And that’s where exercise help. While I don’t have the papers to reference, there is evidence to support the fact that people who train also eat well and stick with their diet for longer periods of time. When people diet they typically lose weight but it’s weight — not fat — they lose. What does that mean? It means they lose muscle mass and they lose fat and potentially end up skinnier without any really shape of definition. It’s what most people mean when they say toning – that’s the nice shape having muscle gives us. If you have no muscle then you look like ‘what you are’ skin covering bone and that’s not a good look. The right combination of the right exercises with the right diet on the other hand leaves you looking fitter, healthier and feeling good too. Not to mention the fact that people with more muscle burn more calories (they have a higher metabolism) so it’s a win-win-win situation on many fronts. While personal training isn’t for others (some people prefer a small group or class), a one-to-one session is the quickest way to get in shape, lose weight, burn body fat and build a better looking, healthy body. Our gym in Crawley is unique in that we’re not a mainstream commercial gym. We don’t have station upon station of cardio machines. We don’t have meat-heads who’ll stare at you when you walk into their domain and we know all of our members by name. Our gym is a cool place to train, it’s super-friendly and we get great results. Enter your name and telephone number in the enquiry box on the side of this page and we’ll give you a call back to talk through your training goals and get you started as quick as possible. Or you can call us on 01293 552 511 and if we don’t answer (because we’re probably training someone) leave a message and we’ll get back to you as soon as possible. Fat loss (better than weight loss) is super simple. And that’s it. That’s enough to get most people 80 – 90% there and achieving their goals. But simple doesn’t always mean easy. You have to be ready to change and you have to want to change. Now you don’t have to confine yourself to the world or broccoli, chicken and tupperware pots to achieve those goals. But the better you can be, the quicker you’ll see results. We can help guide you with better nutrition and meal plans. We can train you to make sure you’re burning extra calories and preserving your muscle mass (this is what toning is all about). And we can offer you the moral support — or more bluntly a kick up the backside and accountability — but it’s up to you to take the first step towards changing your healthy, how you look and how you feel. If you’d like to have an informal chat about our personal training and your weight loss goals you can call us on 01293 552 511 or better still (we’re spend a lot of time training people) enter you name and email address in the enquiry box on this page. The first step is the hardest and it gets easier (and better) from there! We know that if you’re investing your time, money and energy into personal training then you want a return on that investment. And it’s in our interest to see you achieve your goals, realize that investment and feel good again. But — there is a but — we can only do it if you can set SMART goals and one very special ingredient. Your goal has a meaning and significance in your life. There is a specific number attached, it’ s not just a random statement about losing weight. A measurable goal — that’s obvious — you measure your weight but if you’re super serious about measuring and monitoring your weight loss efforts you should really think about getting that tape measure out and writing down the inches around your waist, your upper arms, your thighs, calves, chest, hips and neck. Plus — this is a biggie — determine your body composition. How much of you is fat? And how much of you is lean mass (not fat). These two measurements (and not just weight) are more important than most people realize because sometimes your weight won’t change even though your body is. An increase in muscle and decrease in body fat won’t show on a weighing scale but you will see it when you look in the mirror, try on your skinny jeans or measure your body. Your goals must be achievable. There’s no point in trying to lose two stone in a month. You likely won’t achieve it and more than likely feel crap for failing. But a meager two pounds per week is a stone in 7 weeks. That is realistic or if you’re serious, then maybe a 12 pounds in 4 weeks — but two stone — unlikely. Which brings me onto realistic. You must pick a realistic weight loss target per week and as part of your bigger goal. If not you run the risk of failing, feeling crap and giving up. Not because you failed but because you set an unachievable and unrealistic goal. And last there has to be a time frame in place. Without a time frame a goal takes as long as it takes. If you give yourself an hour to workout, it will take an hour. Give yourself two and it will take two. The same is true with weight loss. You can give yourself 8 weeks to lose a stone and do it in eight weeks. Or you can forget a time frame, procrastinate, put it off, drag it out and then give up. A time frame (and deadline) that’s realistic is super important. And the missing ingredient, your goal needs to have purpose and real meaning to your life. I learned a long-time ago there are two reasons people do (and want) anything. There’s the reason they tell you, and there’s the reason they don’t tell you. That’s the reason they keep secret and to themselves. People tell you they want to look good, feel good and be healthy. But there’s a secret behind that and a real reason. It might be to look better naked for their partner, to attract a partner or it might be because your family have a history of heart disease, diabetes and you don’t want to be the next victim. We all have two reasons for doing anything — the reason we tell people and the real reason we keep to ourselves. This is the MISSING INGREDIENT — it’s remembering and keeping your real reason and motivation for losing weight, getting in shape, putting on muscle or whatever your goal might be. Keep the real reason at the front of your mind and remind yourself of it every time you start to stray from the course, when you think about missing a training session or eating a not-so-tasty take away meal that does you no good. If you’d like to find out more about losing weight, getting in shape and — as importantly — getting a helping hand to support you every step of the way why not get in touch and find out more about our group training classes and personal training? With a team of full-time trainers (male and female) we’re here to help train, advise and support you on your fitness, fat loss and training journey. Enter your name and telephone number on the enquiry form on this page (or visit our personal training page) for more information.